It was back in 1958 when Jerry Crew cast those footprints that gave the word "bigfoot" to the American vernacular. It probably wasn't thought about at the time, but certainly a creature such as this would leave handprints occasionally as well. This has certainly been the case, though it seems often underexamined by both the media and investigators. 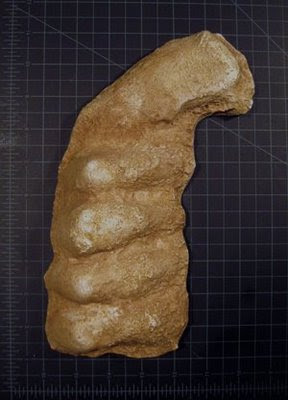 On my website, I have started to feature foot and hand impressions that are attributed as being from sasquatches. I recently posted another, and thought it interesting enough to feature on the blog. When skeptics claim that there is no "hard evidence" for the existence of sasquatches, they are confusing "hard evidence" with "absolute proof". These casts are supportive evidence, and certainly hard enough. Wasn't it Rene Dahinden that offered to hit skeptics on the head with the Cripple Foot casts when they claimed there was no "hard evidence"? Enjoy the newest cast featured in my ever-growing cast/impression database. One of the first casts in my collection, the "Knuckles" print remains one of my favorites. Not only is it novel in that it's a handprint of a bigfoot, but it shows some very interesting anatomical features. The thumb seems excessively thick. This is likely due to a combination of factors. First of all, the fat pad on the palmer surface of the thumb seems to be very thick, making the thumb impression 1.7 inches thick. It is also possible that the thumb shifted positions as it impressed into the ground, thus making it seem thicker than it really was. On the thumb is a clear impression of a thumbnail. The positioning of this thumbnail gives some insight into the thumb of a sasquatch. It seems that the thumb is rotated outwards towards the other fingers. This makes the thumb close inwards towards the palm, like the other digits. This has been noted in eyewitness accounts. The thumbs are described as curling around objects in the same direction as the other fingers. Note the thumbnail in the lower left. It is the opposability of the human thumb that gives us the ability to grip small objects and do an amazing array of other things with our hands. Certainly the sasquatch can do many amazing things with their hands as well, but probably not the same things we can. Hand comparisons from Dr. Fahrenbach's excellent article. The hand is inferred to be squat and stout. The metacarpals (bones found in the palm) are inhumanly short, as are the segments of the fingers. Other hand prints correspond very nicely to this unique impression. This cast is widely circulated. Ken and Linda Steigers, who own most of the Freeman collection, frequently give first generation copies as gifts. I bought my copy from Dr. Grover Krantz in the mid 1990's, probably making it a first generation cast as well. This impression came from a line of footprints from an individual nicknamed, "Dermals". The footprints from this individual display excellent dermatoglyphics. My friends at the TBRC have posted an excellent article on handprints. It is definitely worth a read. This article has been slightly modified from the version found on the website. Great blog Cliff! I need to add this cast to my piddley collection at some point. Can you help a brother out? See you in Yakima!